It sounds like a lot of Masonic work, and it was. The RAM installation was purely a proclamation but the Mark ceremony was an advancement of a new member. Middleton Lodge of Royal Ark Mariners 1303 held their latest meeting on 3rd April at 6:00 pm prompt in the small lodge room downstairs, at the Middleton Masonic Centre. There was a happy coincidence in that there was an earlier meeting of the 2021 Festival Committee and Ambassadors and many of them opted to stay on for the RAM and Mark meetings. The room was comfortable and pleasantly full with RAM members from across the Province. The W.C. David John Halford and his officers opened the lodge and proceeded with the business on the summons. The Deputy Provincial Grand Master W.Bro John Hartley Smith was welcomed to the lodge by the Worshipful Commander and received warmly by the brethren. The lodge was happy to accept that their current Commander continue in office for a further year so a simple proclamation was announced to remind the W.C. of his obligation to the Office. All went well and the W.C. appointed his officers for the ensuing year. 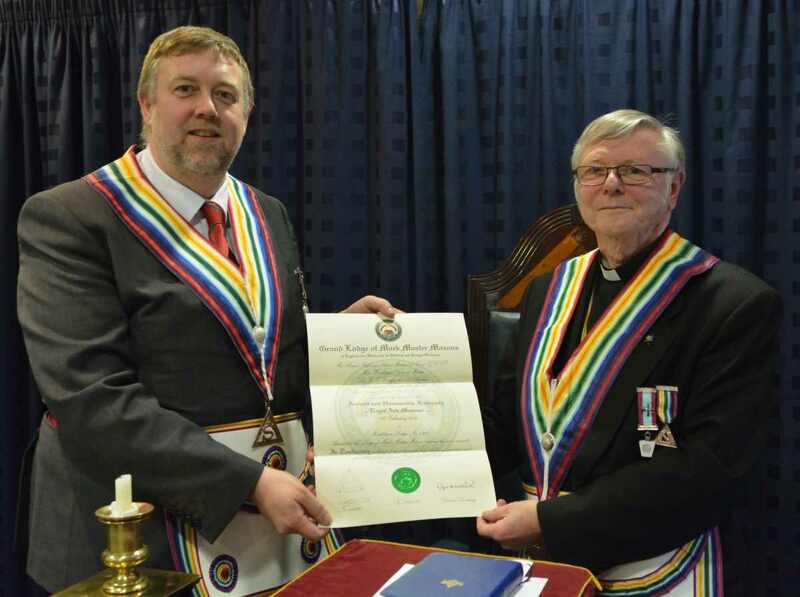 The W.C. David John Halford then had the wonderful opportunity to present a Grand Lodge Certificate to his son, Christian David Halford. Some of the detail on the certificate was explained in depth by the D.P.G.M. who indicated the layout of the document and the meaning behind some of the names and symbols. He then passed it to the Master for presentation to his son. A very special moment indeed. 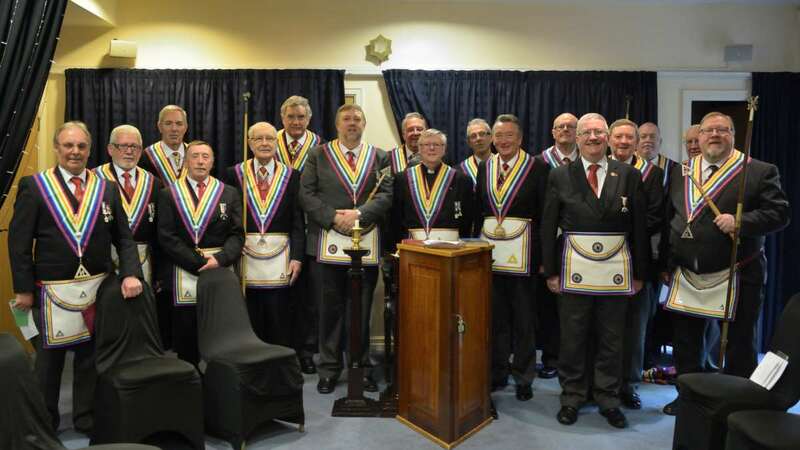 After the Lodge had been closed and the furniture removed from the room the proceedings continued in the Mark Degree. Many hands made light work of the changeover and in little time we were all ready to commence with the ceremony of Advancement. 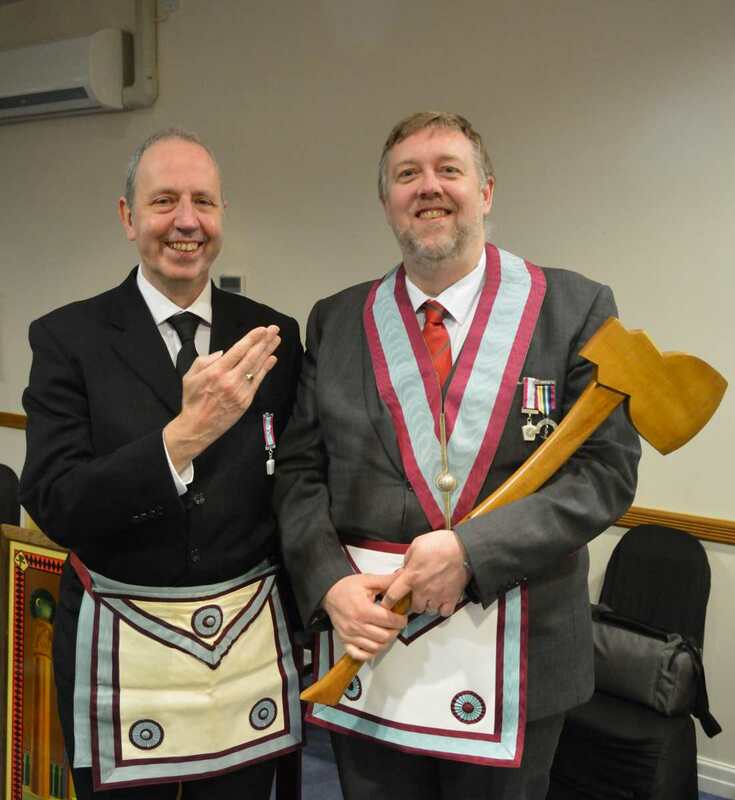 The Lodge was opened by the Worshipful Master and in much the same manner as previously, the Deputy Provincial Grand Master was welcomed into Middleton Mark Lodge No 1303. The ballot which took place for the candidate, W.Bro Paul Doran of a member of Tonge Hall Lodge No 8763, was ably conducted by the deacons and proved successful. The ceremony of Advancement, as we all remember, is a serious message tinged with a bit of fun along the way. The lesson is one we should all remember as we progress through our Masonic journey. The story and actions required in the ceremony were well delivered by those involved in the work and the candidate responded perfectly. The summons concluded with several ballots and Reports before the WM finally closed the Lodge. It had been a long evening but a worthy nights work in the Lodge Room. The Social board also took place in the same room and the transformation from Lodge to the dining room was remarkable. By the time we had disrobed and purchased a much-needed drink at the bar the catering staff where ready for us to return and commence our meal. The main course was a real treat of Scampi with Tartar sauce and chips, followed by Jam sponge, then cheese and biscuits. Many of the brethren were slowing down by then. The toast list was well conducted by the DC and a collection for the Festival took place towards the end of proceedings. A wonderful evening of Mark and RAM masonry ended quite late around 10:30 PM but I feel sure that the evening was enjoyed by all who had the privilege to be there.